If the windows in your house, small office, residential block or high building need washing, you can count on our cleaning operatives to do the work. They can utilize all kinds of devices and systems which ensure safe and perfectly cleaned window glasses and frames. The work can be done during the night, at the weekends or at any other time which is convenient to the customer. Our employees work with no disturbance of the customer and can wash windows from the ground or using all kinds of platforms, cradles and ropes to access higher areas. 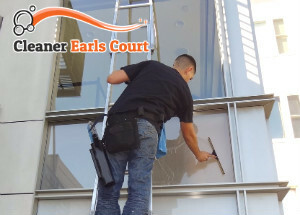 The window cleaning which we provide is available in Earls Court SW5 during weekdays, weekends and bank holidays. Use our reliable services which will make your property look perfectly clean from its outside. Our operatives check the property in advance and choose the most suitable method for sanitising its windows. They work in compliance with Health and Safety guidelines and test the device before using it. The reach and wash system which we provide is carried out for windows that are located no more than 80 feet high. Our staff work from the ground with water fed poles that are supplied with purified water coming from tanks, mounted in their vans. The jets are pumped up from the poles and a soft bristled brush removes the dirt. The windows are washed and rinsed, after which are left to dry. 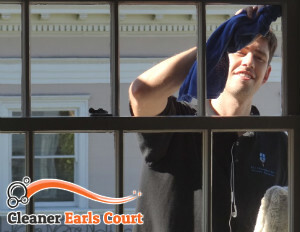 Reserve the window cleaning which you need that we offer in and near Earls Court at competitive rates. Our cleaning operatives can provide excellent sanitising of your windows working safely from cradles, cherry pickers and ropes. They can implement the professional window cleaning which every customer needs in his domestic, commercial or industrial estate, located within SW5 or anywhere nearby.